Tanks with a fixed or floating roof are used to store liquid and fluids resulting from industrial manufactory processes: tanks and roofs have to be completely leak-proof and they have to ensure complete safety and security. The presence of a leak, even if not noticeable without specific tools, can be very dangerous. It can involve environmental risks and huge economic losses: through an OGI inspection, it is possible to detect every leak source, in order to find out the best and less intrusive way to solve definitively the problem. OGI (Optical Gas Imaging) inspection relies on infrared technology to detect VOC (Volatile Organic Compounds) and to locate their sources. Thanks to the non-intrusive technique, it is possible to take punctual and resolutive actions, removing leaks by repairing the damaged parts. Fugitive emissions from industrial tanks: what are the main causes? Tanks with a floating or fixed roof have to be totally leakproof: they can’t cause any gas, liquid or fluid emission. Sometimes, though, some malfunctioning components or some structural defects can cause losses which are impossible to be detected with the naked eye: these leaks result in a continuous economic loss and in environmental risks. OGI inspections of the tanks enable to detect every leak source without requiring the stop of the industrial processes.VOC emissions can have various causes: often, they result from lining excessively worn or a shell deformation. In both cases, the tank stops being completely leakproof and it enables fugitive emissions to extend to the outside. In the case of a shell deformation, usually, fugitive emissions grow fast, causing big economic losses in a short amount of time. Other common causes of fugitive emissions from tanks are some malfunctioning pulmonary valve or flange: each of this leak sources can be detected with an OGI inspection, even when there are no clear indications of a gas or fluid loss. How does an OGI inspection works? Tanks OGI inspection technique relies on infrared rays to show on a display, in real time, every gas leak and to detect the correspondent source. This information leads to two types of results: the first one is a close analysis, carried out even from a small distance, which enables to detect fugitive emissions sources even in areas with a lot of industrial components, such as flange and valves. The second one is the chance to carry out a long distance analysis, in order to detect bigger leaks and sources on inaccessible components. In this way, OGI technique detects also fugitive emission sources which are not detectable through a traditional sniffing campaign. Through an OGI inspection with a sources census, it is possible to verify the proper functioning of every potential source and to create an archive for easier monitoring operations in the future. 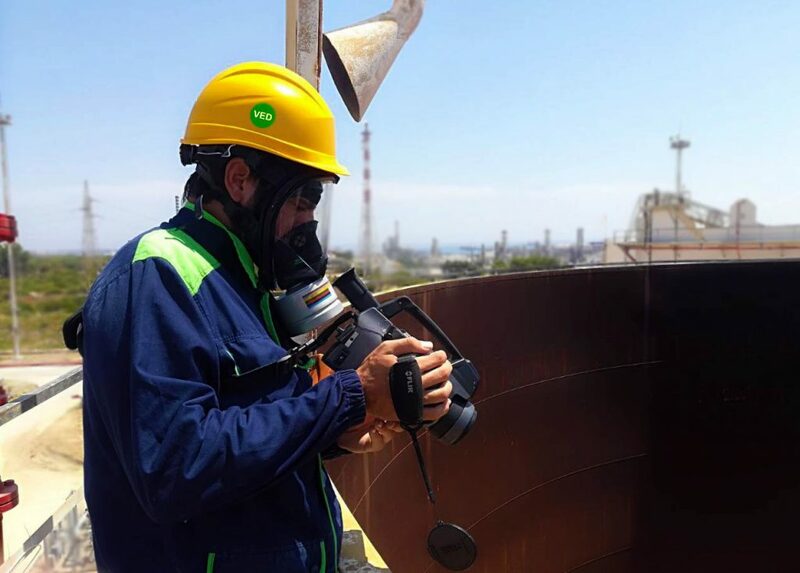 When a fugitive emission source is detected, OGI inspection enables the identification and monitoring of every loss, in order to develop a proper intervention strategy. OGI inspection enables to come up with definitive solutions which completely eliminate the problem. OGI inspection can be conducted in two different ways, based on specific needs. Active OGI inspection relies on a laser ray whose wavelength is absorbed by the gas. The camera captures the infrared radiations that come from the gas and translate them into electrical signs, showed in the form of real-time images. Passive OGI inspection creates the image relying on sunlight reflection in the infrared area of the monitored gas. Passive OGI inspection tools permits to detect the different radiation coming from the VOC, by showing them as dark spots in motion. Tanks OGI inspection offers many benefits compared to other intrusive techniques for fugitive emission detection and monitoring. Above all, OGI inspection facilitates the detection of fugitive emission in a short time, in a non-intrusive way and in a long-distance analysis. Moreover, tanks OGI inspection can be carried out really quickly: thermal imaging cameras are easy to use and handle, they are easy to be carried on every production site and they can be used for any tank with a fixed or floating roof. OGI inspection technique can be inadequate at higher temperatures instead. It is not the best solution to adopt if VOC gas temperature is really close to environmental temperature and if gas exceeds the threshold value of 10 g/h for aliphatic hydrocarbons. Do you want to find out if OGI inspection is the best solution to ensure the right prevention and monitoring of your tanks? Contact us and you’ll receive our personalized assistance!